Compatible Model : EF-M 22mm f/2 STM. 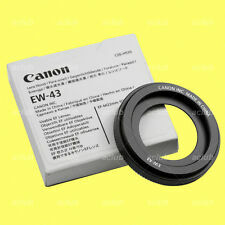 Canon EW-43 Lens Hood. ▷ Fuel / Oil Hose. ♢ Lens Cap. ♢ Stainless Steel Braided CPE. ♢ Stainless Steel Braided PTFE. Designed to prevent stray light from entering the lens in order to keep unwanted glare from affecting your photographs. Compatible Model : EF-M 18-55mm f/3.5-5.6 IS STM. Canon EW-54 Lens Hood. ▷ Fuel / Oil Hose. ♢ Lens Cap. ♢ Stainless Steel Braided CPE. ♢ Stainless Steel Braided PTFE. Designed to prevent stray light from entering the lens in order to keep unwanted glare from affecting your photographs. Compatible Model : EF-M 15-45mm f/3.5-6.3 IS STM. Canon EW-53 Lens Hood. ▷ Fuel / Oil Hose. ♢ Lens Cap. ♢ Stainless Steel Braided CPE. ♢ Stainless Steel Braided PTFE. Designed to prevent stray light from entering the lens in order to keep unwanted glare from affecting your photographs. Compatible Model List (1 of 2) : EF-S 18-55mm f/3.5-5.6 IS STM. Compatible Model List (2 of 2) : EF-S 18-55mm f/4-5.6 IS STM. Canon EW-63C Lens Hood. ▷ Fuel / Oil Hose. ♢ Lens Cap. ♢ Stainless Steel Braided CPE. Genuine Canon Lens hood, fits EF 35-105mm f/4.5-5.6 Lens. FAMILY RUN SINCE 1954. Compatible Model List : EF-M 55-200mm f/4.5-6.3 IS STM. Canon ET-54B Lens Hood. ▷ Fuel / Oil Hose. ♢ Lens Cap. ♢ Stainless Steel Braided CPE. ♢ Stainless Steel Braided PTFE. Designed to prevent stray light from entering the lens in order to keep unwanted glare from affecting your photographs. 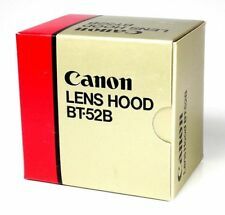 CANON Lens Hood BT-52B New Boxed Unused For New FD 75-200mm f/4.5. This Canon lens hood only fits the lens model shown below. No lens included, you are buying a lens hood. New, boxed and unused. that look like the lens model shown below. Classic Canon lens hood. Made in Japan. We know how important quality is, and we ensure that each and every item is thoroughly checked over before we list, so that we can give us much detail as we can. Fits New FD 75-200mm 4.5. Canon 75-200mm F4.5 FD. Canon FD 85mm f1.8. Canon FD 100mm f2.0. Canon FD 100mm f2.8. Canon FD 100mm f4.0 macro. Fits new FD lenses but not breachlock. The Canon EW-73D Lens Hood for the EF-S 18-135mm f/3.5-5.6 IS USM lens is designed to prevent unwanted stray light from entering the lens by extending and shading the end of the lens. In addition, since the end of the lens is extended, you also get the added benefit of extra protection from accidental impact. Compatible Model (1 of 3) : EF 85mm f/1.8 USM, EF 100mm f/2 USM. Compatible Model (2 of 3) : EF 135mm f/2.8 Softfocus, EF 70-210mm f/3.5-4.5 USM. Compatible Model (3 of 3) : EF 75-300mm f/4-5.6, EF 100-300mm f/4.5-5.6 USM. 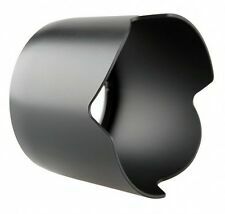 Genuine Canon lens hood. FAMILY RUN SINCE 1954. Canon BT-58 lens hood for FD 70-210 f4, 80-200L f4, 100-300 f5.6 and 100-300 f5.6L lenses. Not in fabulous condition, but this is reflected in the price. 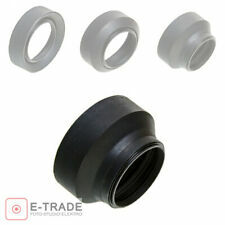 Genuine Canon Lens Hood fits Canon ET-60. EF 75-300mm f/4-5.6 III USM. Compatible Model : EF 28mm f/2.8, EF 35mm f/2. Canon EW-65 II Lens Hood. ▷ Fuel / Oil Hose. ♢ Lens Cap. ♢ Stainless Steel Braided CPE. ♢ Stainless Steel Braided PTFE. Designed to prevent stray light from entering the lens in order to keep unwanted glare from affecting your photographs. Compatible Model : EF 24-105mm f/3.5-5.6 IS STM. Canon EW-83M Lens Hood. ▷ Fuel / Oil Hose. ♢ Lens Cap. ♢ Stainless Steel Braided CPE. ♢ Stainless Steel Braided PTFE. Designed to prevent stray light from entering the lens in order to keep unwanted glare from affecting your photographs. Good condition, working order genuine part. Canon ET-65 lens hood. Light use only, minor scuffs. EF 90-300mm f/4.50-5.6 USM. Compatible Model : EF 50mm f/1.8 STM. Canon ES-68 Lens Hood. ▷ Fuel / Oil Hose. ♢ Lens Cap. ♢ Stainless Steel Braided CPE. ♢ Stainless Steel Braided PTFE. Designed to prevent stray light from entering the lens in order to keep unwanted glare from affecting your photographs. STM, which uses EW-73B lens hood. Compatible Model (2 of 2) : EF-S 18-135mm f/3.5-5.6 IS STM. 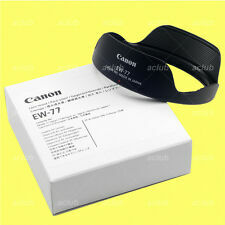 Canon EW-73B Lens Hood. ▷ Fuel / Oil Hose. USM, which uses EW-73D lens hood. ♢ Lens Cap. ♢ Stainless Steel Braided CPE. The CanonET-60 Lens Hood drastically reduces glare whilst improving image quality and contrast on photos taken with the Canon EF 75-300 mm lens. Compatibility: Canon EF lens. Compatible with Canon EF lenses. Canon Japan W-69-B. Lens hoods are very useful lens accessories, as they keep stray light. away from the lens surface making sure that images are sharp and contrasty with no flares. Genuine item made in Japan! Canon EW-73B lens hood - virtually unused. Canon W-69-B Clamp-on 69mm Lens Hood for CANON Lens FD 28-50mm 1:3.5 - MINT! Canon Japan W-69-B. Lens hoods are very useful lens accessories, as they keep stray light. away from the lens surface making sure that images are sharp and contrasty with no flares. In Mint Condition! Canon Original EW-78D Lens Hood for EF-S 18-200mm f/3.5-5.6 IS. - light use only, minor scuffs. Canon lens hood EW-83E in excellent condition - originally cost £24.99. 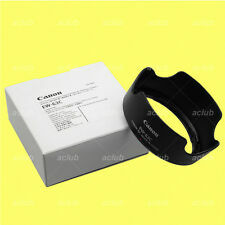 Canon EW-60 lens hood for EF 24mm f/2.8 Lens. This lens hood is specifically for the Canon EF 24mm f/2.8 lens. It is in good condition. Genuine EW-72 Canon hood for the 35mm f/2 IS lens. Locks perfectly, see photos for conditon. CANON EF 24mm f/2.8. This can lower the contrast of the image. Lens hoods also have two other very practical uses. Compatible Model : EF 135mm f/2L USM, EF 180mm f/3.5L Macro USM. Canon ET-78 II Lens Hood. ▷ Fuel / Oil Hose. ♢ Lens Cap. ♢ Stainless Steel Braided CPE. ♢ Stainless Steel Braided PTFE. Designed to prevent stray light from entering the lens in order to keep unwanted glare from affecting your photographs. Genuine Canon T-50 lens hood for 50mm 1:1.4, 135mm 1:2.5 Rangefinder lens also 50mm 1:1.8, 100mm 1:3.5 and 135mm 1:3.5 FL lenses (or others that have the 48mm filter thread), genuine Canon original item. Genuine Canon lens hood fits 70-300mm f/4.5-5.6 DO IS USM & EF 70-300mm f/4-5.6 IS USM Lenses. FAMILY RUN SINCE 1954. Canon EF 28-80 f/3.5-5.6 II / USM IV / USM V. I will deal with any issues promptly and fairly. EF-S 18-55 f/3.5-5.6. Compatible Model : EF-M 18-150mm f/3.5-6.3 IS STM. Canon EW-60F Lens Hood. ▷ Fuel / Oil Hose. ♢ Lens Cap. ♢ Stainless Steel Braided CPE. ♢ Stainless Steel Braided PTFE. Type : Lens Hoods. ♢ Lens Hoods/LCD Hoods. Genuine Canon BT-52 lens hood fits nFD 50mm 1:1.2L, 50mm 1:1.2, 50mm 1:1.4, 50mm 1:1.8 lenses (NEW FD/nFD versions only), genuine Canon original item. Genuine original Canon item made in Japan and not a cheap copy. EF 28-80mm f/3.5-5.6 III USM. EF 28-90mm f/4-5.6 III. EF 28-80mm f/3.5-5.6 II USM. EF 28-90mm f/4-5.6 II USM. EF 28-90mm f/4-5.6 II. EF 28-80mm f/3.5-5.6 II. EF 28-80mm f/3.5-5.6 V USM. EF 28-80mm f/3.5-5.6. Compatible Model (1 of 2) : EF 40mm f/2.8 STM. Compatible Model (2 of 2) : EF-S 24mm f/2.8 STM. Canon ES-52 Lens Hood. ▷ Fuel / Oil Hose. ♢ Lens Cap. ♢ Stainless Steel Braided CPE. ♢ Stainless Steel Braided PTFE. Compatible Model : EF-S 55-250mm f/4-5.6 IS STM. Canon ET-63 Lens Hood. ▷ Fuel / Oil Hose. ♢ Lens Cap. ♢ Stainless Steel Braided CPE. ♢ Stainless Steel Braided PTFE. Designed to prevent stray light from entering the lens in order to keep unwanted glare from affecting your photographs. Applicable models EF - S55 - 250 mm F - 5 - 6 IS STM. Applicable lens: EF-S55-250mm F4-5.6 IS STM. Model number: Canon Lens hood ET - 63 L - HOODET 63. Manufacturer model number: L-HOODET 63. Cap attachable: possible.